The miniDSP nanoAVR DL integrates the world-renowned Dirac Live® room correction algorithm into a palm-sized HDMI audio processor. The onboard floating-point SHARC processor allows complete frequency and phase correction of a 7.1 home theater or multichannel audio system. The results from deploying Dirac Live® are remarkable: improved imaging and soundstage; greater clarity of vocals and dialog; smoother and more impactful bass; heightened realism. Last but not least, our free Android and iOS App provide live control of basic settings such as volume/mute/presets. An all in one control remote from your tablet/phone. Simply put: a better home theater experience! Two popular methods of room correction are Room EQ Wizard (REW) and Dirac Live™. In this application note, we will compare and contrast these two methods. 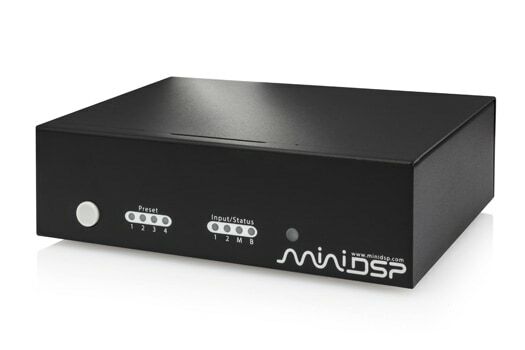 miniDSP has several products that incorporate the Dirac Live algorithm, including the stereo Dirac Series, the multichannel DDRC-88A and nanoAVR DL, and the forthcoming compact miniDSP 2x4 DL. An inmediate and easy set-up for a home theather system, with really GREAT results in sound. This little black box brings magic to a multichannel system. Highly reccomended.